Adam Beyer and his label cohorts return to the ancient burial ground of Tobacco Dock for its annual haunting. As hoard of fiends again descend on East London, you can expect a stellar line-up of Drumcode's core artists and A-list guests providing the darkest, most bone-rattling, apocalyptic techno in the universe. Drumcode boss and the dark lord of techno Adam Beyer returns to his favourite haunting place - Tobacco Dock. The Swedish DJ will play a special extended 4-hour set, closing the cavernous Great Gallery with the label’s trademark sound. He is joined in Wapping by a wicked assortment of label cohorts and fellow scene luminaries from the techno stratosphere. His most recent studio collaborator, Bart Skils is the first name down - and we’re anticipating attendees Losing Their Mind on the dancefloor under Tobacco Dock’s hallowed beams. The ever-present UK Drumcode representative of Alan Fitzpatrick and Dense & Pika are back - it wouldn’t have been the same without them. LWE residents and Kneaded Pains supremos have been steadily increasing their output for Drumcode, racking up appearances across Europe at their events. Alan Fitzpatrick’s profile is on an upward trajectory thanks to his explosive We Are the Brave imprint, which has brought 90’s-tinged rave euphoria back to the modern scene. On Saturday 27th October he brings label stablemate Boxia along for the ride. Promising to shift the mood, Nicole Moudaber returns to Tobacco Dock as does Spanish techno envoy Paco Osuna. Maybe we’ll be treated to one of the pairs rip-roaring back-to-backs for the occasion? After a hiatus last year, 2016 appearance-maker and Italian stallion Marco Faraone is back in Wapping to continue his Drumcode Halloween story. 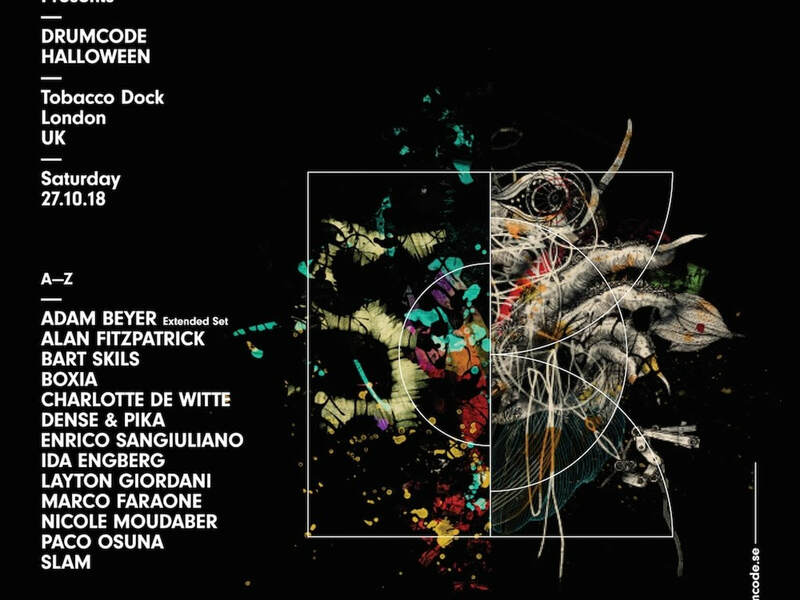 Following on from their Drumcode Halloween debuts last autumn, proteges Enrico Sangiuliano and Layton Giordani are both back. The two most recent suppliers into Drumcode’s album vaults, Sangiuliano’s futuristic concept album Biomorph has been one of the LPs of the year, while it was preceded by Layton’s 2016 Where It Begins. Representing part of techno’s nu-breed, Charlotte de Witte is the Belgian starlet rising to prominence with her penchant for the acid and spooky, distorted vocals. She follows in the footsteps of countrywoman Amelie Lens last year, by debuting at Drumcode Halloween. Finally, legends wraps up the line-up. Glaswegian underground stalwarts and bosses of the seminal Soma records Slam touchdown in London, bringing their seriously heavy brand of techno with them. Keeping with previous years, it’s another peddle to the floor, stellar ensemble of artists for London’s definitive Halloween party.